The Rockies vs. the Northeast: Who has the Best Fall Colors (and Where to Find Them)? It’s that bittersweet time of year: There’s a new crispness in the air, pumpkin spice everything is back on the menu, and, most importantly, the leaves have begun to turn. All that means summer is just about over, but there’s a definite upside—it’s leaf-peeping season all over the United States. Of course, the onset of autumn brings up some fairly heated discussions about where, exactly, you can find the absolute best fall foliage. Ask just about any hiker, and they’ll give you a strong opinion, whether it’s a favorite hike, a scenic drive, or a particular region that has the best fall colors. The most prominent of these ongoing debates, of course, is the age-old question: Are the best fall colors in the Northeast or the Rockies? It’s not an easy question to answer, so we set out to find experts in both regions and put the matter of fall foliage to rest. Representing the Rockies is yours truly: Emma Walker, an adventure and travel writer with a lifelong connection to the Rocky Mountains. I was born and raised in Golden, Colorado and am now based in Boise, Idaho, both of which are excellent jumping off points for fall leaf-peeping. To get some insight on fall colors in the Northeast, I talked to two travel writers with deep roots in the area. I spoke with Meryl Pearlstein of Travel and Food Notes, a travel writer based in New York City who grew up in Massachusetts making leaf-peeping pilgrimages to New Hampshire and Vermont. 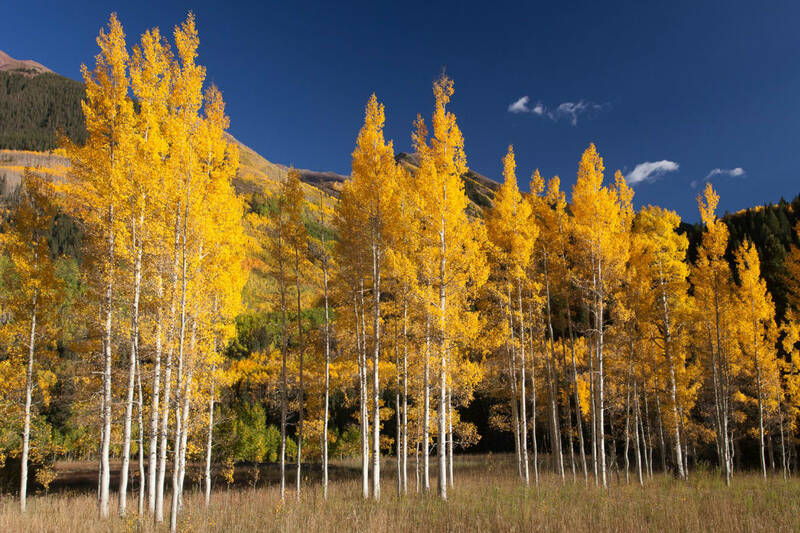 Also representing the Northeast in this foliage showdown is Renee Sklarew, a journalist and the co-author of 60 Hikes within 60 Miles Washington, D.C.
Aspen trees in the Rocky Mountains feature unforgettable gold colors. When it comes to fall color, the Rockies have the world’s biggest organisms on their side: aspen trees. These delicate, silver-barked trees are connected by their roots, so the enormous groves you’ll see stretching across entire hillsides are actually one gigantic living plant. They’re pretty during the spring and summer months, sure, but autumn is when they really let their light shine as their distinctively shaped leaves twinkle with pure gold. And it’s not just one shade of yellow— from bright, sunshiney yellows to deep oranges and golds, these trees run the gamut. The verdict: I’ll concede. The Northeast wins this round—those red leaves are something else. Winter comes on faster at high elevations, and considering that Denver, the so-called Mile High City (named for its 5,280-above-sea-level positioning) is among the lowest-elevation spots in Colorado, it’s no surprise that things ramp up early in the Rockies. When there’s been an unusually dry summer, leaves often begin to change as early as the beginning of September. 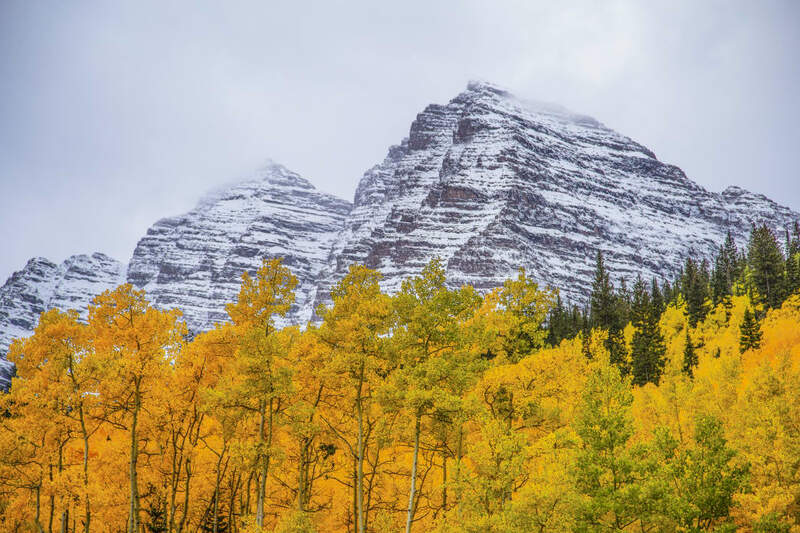 Things get going in the Steamboat area during the third week of September, and they’re changing in the iconic Maroon Bells area near aptly-named Aspen by late September and early October. The lower elevations (think Northern Colorado) may still be showing off in mid-October, and things wind down (or fall down, as the case may be) quickly after that. The verdict: We’ll call this one a tie. Should you find yourself in the city in the Northeast, you may not have much time to catch the changing of the guard, though if you can get out and about, you’ve got plenty of time. In the Rockies, though, you’re looking at a few weeks of literal gold just about everywhere. The rugged peaks of the Rockies rise over the aspens at Maroon Bells, one of Colorado’s most popular spots for leaf-peeping. The land of purple mountains’ majesty makes an unbelievable backdrop for leaf-peeping. The Maroon Bells, which are among the most photographed features in Colorado, are truly breathtaking in the fall, and not just because it’s chilly and at super-high elevation. With jagged peaks, often dusted in snow as early as September and October (especially at higher elevations), you’re not just taking in views of the leaves—this is mountain magic. The Northeast, on the other hand, has the advantage of rolling mountaintops as far as the eye can see. From many vantage points on the Appalachian Trail, for example, you can see rich tapestries of fall color all the way out to the horizon in all directions on a clear day—these kinds of views are blocked, in the Rockies, by peaks that sometimes reach above 14,000 feet. The verdict: OK, I’m a little biased, but I’m giving this one to the Rockies. Those rugged, rocky peaks are something else. With one category going to each region, plus one tie, it’s impossible to say for sure where you’ll find the best fall colors. You’ll just have to make your way on a foliage pilgrimage to both regions and decide for yourself. The White Mountains in New Hampshire is one of the Northeast’s most popular spots for fall colors. It’s hard to narrow down the very best spots—they truly are infinite—but we’ve curated a few of our favorites. In the Rockies: Maroon Bells, of course, is a no-brainer. Drive over Rabbit Ears Pass, near Steamboat Springs, in mid-September for a mind-numbing array of golden aspens, or take the train through Georgetown and hike at Guanella Pass. Farther north, head to Sun Valley, Idaho, for mountain town vibes and gorgeous golds. 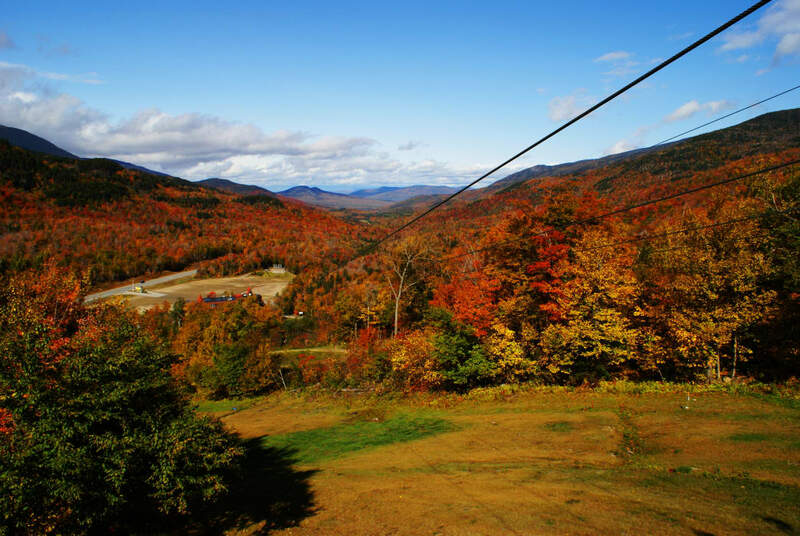 In the Northeast: Pearlstein recommends driving through the White Mountains in New Hampshire, where you can see colors as early as the beginning of September, or heading to Vermont’s Stratton Mountain Region. Further south, Sklarew suggests visiting Leesylvania State Park in Woodbridge, Virginia, for paddleboarding and a crisp hike, or making for Sugarloaf Mountain in Dickerson, Maryland. While the rivalry between the Rockies and the Northeast may be fun, the truth is that you can have an incredible experience in either place. Don’t let the season pass you by without taking the time to stop and see the show.